Connecting "embedded" controllers via the Internet has become more and more popular in the last time. All over the world computers are using the common Ethernet cabling standard and TCP/IP as common protocol family. Therefore linking the control network over a gateway to office or automation network or to the internet at all via TCP/IP is an interesting and cost-effective solution. This task is fulfilled by the CAN-TCP/IP gateway EtherCAN. The basis for the EtherCAN is formed by a powerful 32-bit CPU with integrated Ethernet controller and the CAN controller SJA1000. The gateway EtherCANopen is based on the operating system LINUX and undertakes completely the handling of the CANopen protocol services. Firmware- and program-update are made possible via FTP. A platform independent user-interface application for the configuration and the operation of CANopen devices (CANopen Device Monitor from Port) exists. Furthermore the integrated HTTP-server, the FTP- and Telnet-services as well as still available EIA-232 (RS-232) interface can be used. The main advantage of such a network linking is the possibility to remote observation and service of machines and installations from any place in the world. The gateway undertakes completely the handling of the CANopen protocol services. To control the CANopen server the protocol defined as CiA 309-3 is used. The Linux Device Server IGW/900 has been created especially for industrial use. That is why, thanks to its compact dimensions, it can be mounted on a DIN-rail and/or in a switchgear cabinet. Its many connection types allow a wide range of possible applications. 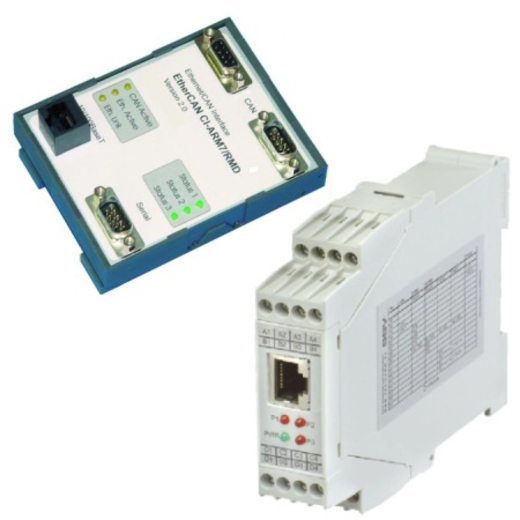 Through the available serial interfaces devices which communicate over CAN network or have EIA-232/-485 (RS-232/-485) interfaces can be merged very easy in an existing 10/100 Mbit/s network. Thus also spatially far apart lying systems can be integrated into an existing network and interconnected. The typical 24 VDC voltage supply of the IGW/900 is made by screw terminals. For comfortable status monitoring the converter has three free assignable LEDs, which e.g. show the availability of the cable connections. With the combination of IGW/900 as CAN interface and e.g. the CAN analyzer CAN-REport an efficient and versatile tool for analysis and commissioning of CAN-based networks is available. The connection between these two components is realized on the basis of the Client/Server model by standard TCP/IP interfaces. This separation permits to use the entire application over TCP/IP networks away. Therewith the employment becomes possible for remote maintenance without additional or modified software over switched lines or the Internet. This connection between the host system at the Ethernet and the local CAN network enabled a comfortable transmission of the technical parameters and facilitate both starting and maintenance.